The factory has today released an official pair of modifications. 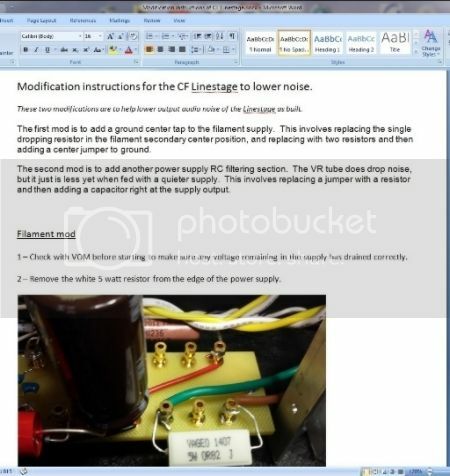 These two modifications are to help lower audio output noise of the linestage as built. In the last couple of months I finally had forced in the time to investigate the greater than desired noise floor on the CF14 Linestage. I found two things that really helped. One is to fuss with the filament supply area. And the other is to add another filtering stage to the power supply. The first is adding a ground to a center tap position of the filament supply. The original transformer has two 6.3v windings. We added those together in series to get a 12.6 supply. And like most all power transformers, if you're not loaded right up to maximum current draw on it, the windings run a little higher in voltage than the specified number. In this case, if I'm remembering right, it was a little over 13 volts. 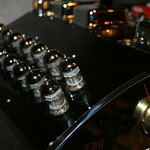 So rather than leaving it be and shortening tube life, the design had a single resistor inserted between the windings. We have that junction on the end of the power supply board. So to effect the mod, we take out that .82 ohm resistor and instead insert a pair of .47 ohm. We drop from a single 5 watt resistor to a pair of smaller 2 watt. This pair gives us the ability to access a center tap point and ground it. This removes a little spike shown in the output audio. To physically accomplish this pair of resistors, we move over one filament wire one post and then run one resistor from each wire to the immediately adjoining ground. OK...then on to Mod 2. In poking at the noise, I was looking at the original idea that a voltage regulator, here a OD3, trims down the DC voltage to the regulation point and in taking off the "top", also trims right off noise that's riding along on the DC. Well, in this implementation, it does reduce ripple from around 160mv AC to about 30mv. A pretty decent number. Well, by adding another filtering section to the supply, we can better this. Out of the simple addition of another R and C element, we can drop the regulator input noise to about 70mv (from 160mv) and coming out of the regulator down to about 6mv from the 30mv. Which is a really tiny amount on 150vdc. Implementing another section without a lot of trouble was worrisome. But it turned out to not be too bad. We have a red wire jumpering down the outside of the supply bringing the DC from the post below the original second cap down to next to the end where we have output + and - side by side. What we do is remove that red jumper and sub in a 30 ohm 2 watt resistor. We go past in input AC on the diodes etc, so we have to insulate the resistor legs and route it with care but that's not too hard by just looking at what's in front of you and bending parts to slightly different elevations. Then with the resistor in place, you drop a third power supply cap into those last two terminal posts, as that's the + and -. DONE! 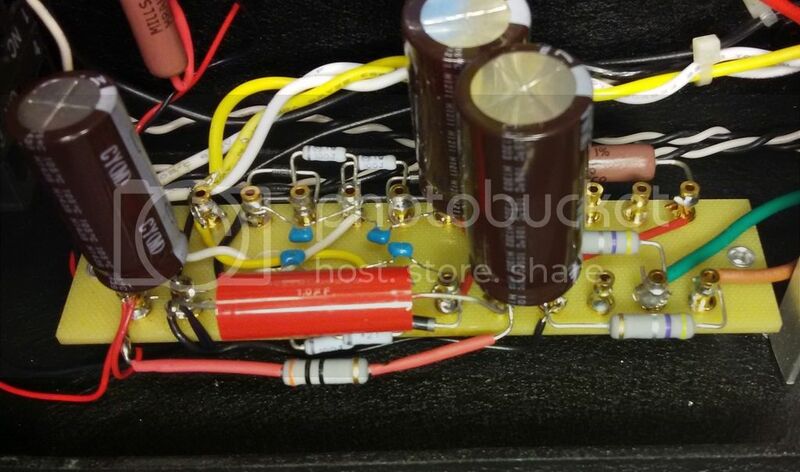 This picture shows the two resistors in the filament supply to the right. Then towards the other side, the added resistor with red heat shrink down low going towards the left end where the added cap is. I've put together a bag with each persons name that bought a LS kit. It has in it, line by line specific info and pictures showing you in detail these two mods. It also has a new full schematic showing the additions. Then, there is two small plastic bags with the parts. The first, is the two resistors for the filament center tap addition. Second bag is for the PS additional filtering and has the resistor with heat shrink and the cap. Also, three people were gone last year before we had the CF LS14 badges on hand, and those three also have those in their mod kit bag. Thanks again to Eric for those! Tools you need...fine needle nose pliers. Very important. Some small dikes to trim ends. And a soldering iron. Should be less than 30 minutes for most to do...an hour for Al and 10 for me to fix it. On four Linestages here, this mod puts the A weighted noise figure down about 80db and results on pretty highly efficient speakers with no noise audible until you stick your ear into the driver and then only barely there. I'm hoping this works well for everyone and is easy to get implemented. Just loaded mine,,thanks for doing this Markie,,guess I will have to be nice to Harry,,as my depth perception ain't so good anymore. I was bringing my LucasLabs LS anyway so this is a great time to do the mods under your tutelage Markie! Maybe I'll put in the Obligatto caps too. Mark,, please put me in the same class as Al! I got my Obligattos in Ray! If anyone wants a pair I have one pair left. Zoot Horn wrote: Mark,, please put me in the same class as Al! I got my Obligattos in Ray! If anyone wants a pair I have one pair left. Are the Obligattos really that good. Do they make a significant change in sound. How much? A hour for Al? Guess maybe I should just save time then & have you do it Markie!! frenchguy wrote: A hour for Al? Guess maybe I should just save time then & have you do it Markie!! These are right there at the edge of the supply like the picture shows. Needle nose are the key...really is. Nobody has small enough fingers to do anything in and around those areas. And were talking the tweezer end kinda ones too Ray...not some plumbers ones! Ill take that pair of obligattos if no one at fest wants them. And BTW, after the fest I'll ask for everybody that has a Linestage and didn't get to the fest for their address, and I'll send out their mod packet. radioeng2 wrote: And BTW, after the fest I'll ask for everybody that has a Linestage and didn't get to the fest for their address, and I'll send out their mod packet.